A little late to the show. This is the 1952 Mercedes-Benz 300SL, known to Benz anoraks as the W194. Only 10 were built, 2 years before the W198 300SL road car debuted. In the best possible proof of concept, they won Le Mans the first time out, in an era that otherwise belonged to Jaguar. 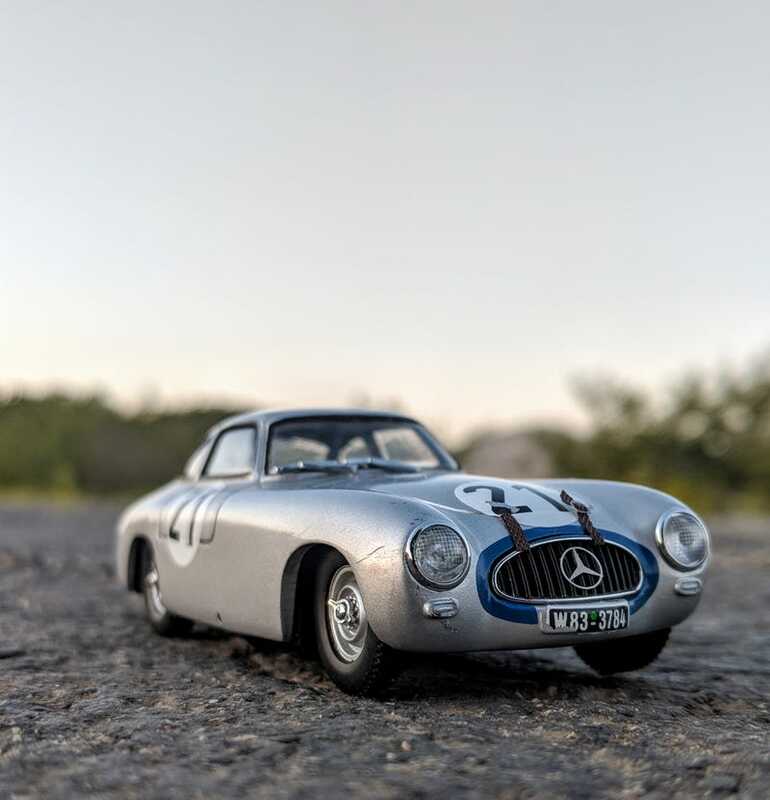 In typical Silberpfeil fashion, they also got second at the Mille Miglia, won at the Nurburgring and owned the La Carrera Panamericana that year. You may recall that last one as the car that famously suffered a bird going through the windshield at high speed. Nowhere near as bonkers as the straight eight in the subsequent 300SLR, the SL was about as logical as can be for a period racing car. It essentially used the carbureted inline six, transmission, and axles from the large, staid “Adenauer” sedans (so called for then-German chancellor Konrad Adenauer, who favored them), in a strong, light space frame, state of the art for the time. The unique doors were necessary to clear the lower frame, and were originally designed to be smaller hatches. This very nearly precluded their entry at Le Mans, as the ACO director was concerned about the ability of the driver to escape quickly. He drew a sketch extending the doors slightly down, to the edge of the frame structure, Mercedes obliged, and thus we got gullwing SLs. Good for around 175hp in race trim, the slippery 2500lb SLs were said to be capable of over 170mph, given enough road. The handling did leave something to be desired, as the location of the large fuel tank and rear swing axle combined to cause odd behavior on the limit, and significant handling imbalance depending on fuel level. These problems could be driven around, however. That swing axle was not like those in old VWs and Corvairs, but a unique design using a pivot at the differential and a large spring between the halves. Mercedes used this design in their road cars for many years, it’s durable and simple but I can attest that it’s not much fun to work on. Driven by Hermann Lang and Fritz Riess, this chassis, number 7, would survive a battle of attrition, inheriting the lead near the end from the mighty 4.5L Talbot driven by Pierre Levegh, who suffered an engine failure. Early on several big Ferraris and a remarkable little Gordini driven by Jean Behra (whose helmet design Autoweek uses as a logo to this day) and Robert Manzon had led and fallen by the wayside. The SLs stayed in touch throughout, and their reliability saw them to the end for a 1-2 finish. Nowadays Le Mans is a 24 hour sprint race, but back then, simply finishing could guarantee a decent result. Three years later Mercedes-Benz would withdraw from international motorsport after Pierre Levegh’s tragic crash at Le Mans in 1955, not returning until the late 80s to seek their last win, which came in 1989. The later CLK-GTRs and CLRs never had much luck (blowovers, anyone? ), but perhaps we’ll see another entry from them in coming years with changing regulations. One can hope. This model is in 1:43 by Max Models, an older piece with a few blemishes, but the detail is quite good for the time. The semi-metallic paint accurately portrays the silver finish as it would have been, a bit dull, and I’ll chalk up the imperfections to a hard-fought race. As I recall, this cost all of $6 on eBay, not a bad find t0 grow my collection of Le Mans winners. Check out Sports Car Digest’s excellent report on the 1952 race above. Well into the morning at Le Mans now, trying my best to stay awake here in California. Wish I could have put more features together, guess I’d better plan for next year. Amazing content here today, what a great showing!